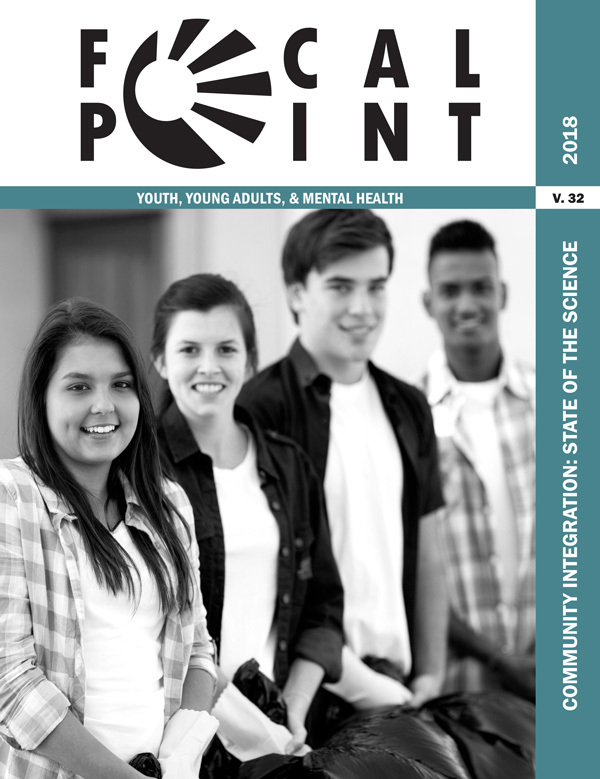 This introduction from Pathways RTC Director Janet Walker explains how each article in this issue addresses the state of the science in the topic of community integration of transition-age youth and young adults with mental health conditions. This article outlines some of the main research findings related to peer support for youth and young adults who experience serious mental health conditions, as well as remaining questions and challenges, and what is being done at Pathways RTC to address these challenges. This project summary describes AMP+ Skills enhancement training for peer support providers that Pathways is developing and testing. This article uses selected frameworks to help stakeholders think about youth and young adult participation in policy and practice, and introduces two new tools for self-assessment of the conditions that support the meaningful inclusion of youth voice. This article describes the work done by Pathways and Youth MOVE National (YMN) to develop and validate the Youth Voice at the Agency Level (Y-VAL) assessement, designed to help organizations and agencies that provide services to young people assess the extent to which youth and young adults are meaningfully involved in advising and decision making. In this commentary, members of the Youth MOVE National (YMN) leadership team describe the role of youth-run organizations in providing a positive youth development (PYD) approach to program development, systems change and workforce development. This article describes how early psychosis intervention programs that facilitate recovery and community participation can help individuals maintain hope, agency, and social support. Examples of involving emerging young adults in community leadership and participator research are presented. This article explores targeted network-oriented approaches designed to help youth and young adults whose social network size and stability may have been limited due to mental health conditions and service system involvement. In this commentary, authors from the leadership team of FREDLA (Family-Run Executive Director Leadership Association) discuss the role of families of young adults with mental health challenges as they transition to adulthood. The authors also outline the need for additional research to inform the development of guidance to the field on family involvement during the transition years. This article reviews the current research on best training practices for mental health service providers who work with youth and young adults. This article describes the results of an online training program for transition service providers, and based on the outcomes of the study, identifies best training practices. This project summary describes Pathways' use of an online training and coaching approach to strengthen key skills for providers working with youth and young adults. This project summary describes the results of an online survey conducted by Pathways Transition Training Partnership and Youth MOVE National (YMN) to gain understanding of the training needs of service providers who work with young people with mental health needs.